There was a time a few centuries ago when people relied on guns to protect their homes from wild animals and intruders. Guns were also used for hunting purposes, specifically in rural areas where there wasn’t much else on hand food-wise. When the US expanded into the “wild west”, guns were required for protection and fighting. Before the American Revolution started in 1765 there was no army, no money to create an army, so every man was considered a soldier, joining his own local militia, so every man needed his own gun. Later on owning a gun became quasi equivalent to freedom and “the right to bear arms” was imprinted into the constitution of the USA, as a direct opposition of previous gun control laws imposed on the colonies by the British. The Second Amendment states the following: “A well regulated Militia, being necessary to the security of a free State, the right of the people to keep and bear Arms, shall not be infringed.” At the time it seemed like an important law, so important that it actually needed to be part of the constitution. But now? In December of 2012, 20 year old Adam Lanza used a semi-automatic rifle to shoot open the doors of Sandy Hook Elementary School in Connecticut, and spray bullets around the school, killing 20 six and seven year olds as well as 6 adults. In June of 2016 29 year old Omar Mateen walked into Pulse nightclub in Orlando, Florida and mowed down over a hundred people (49 killed, 58 injured) with a fully automatic weapon. In December of 2015 two assailants, married couple Tashfeen Malik and Syed Rizwan Farook, walked into a building in San Bernardino in California, and killed 14 people and injured 22 more. In June of 2015 Dylann Roof settled into the Emanuel African Methodist Episcopal Church in Charleston, South Carolina, and then fired into the group of churchgoers, killing 9 people and injuring 3. Roof has been sentenced to death for these murders. And then this week, during the evening of October 1st 2017, Stephen Paddock used his strategic position in a hotel room of the Mandalay Resort and Casino Las Vegas to mow down hundreds of people attending a music festival on the Strip below (current numbers are 58 dead and over 500 injured). I could go on and on, and for a longer list of the deadliest mass shootings over the past few decades, you can have a look at this recent article from the LA Times. There seem to be two schools of thought on what actually defines a “mass shooting”: either a shooting that involves the death of four or more people (not including the shooter), or a shooting that involves injury or death of four or more people. If we go with the latter option then there is on average one mass shooting a day in the US, adding up to the current number of 1,518 since the Sandy Hook massacre in 2012 (the charts in this article do a great job of showing the immensity of the problem). This means that every single day someone pulls out a gun and hurts at least 4 people. If we go with the former method of counting (the federal method) then according to Everytown* there were 156 mass shootings between 2009 and 2016, resulting in 848 deaths. To put this into perspective, since 2001 1,695 US soldiers have been killed in and around Afghanistan… In half of that time half of that number of people have been gunned down in a mass shooting on US soil. Does any of that sound normal to you? Again, there are tons of other maps and charts and figures that can help put everything into perspective right here. Why is having the right to own a gun so important to US citizens, and why do so many fight so hard to stop any kind of gun control bills being passed? Why is it so easy to buy a semi-automatic rifle? Why do background checks and gun purchasing laws differ with each state? Some states even allow you to carry your gun openly, even a semi-automatic. Other states allow concealed carry, even without a permit. I have asked around, trying to understand why, as it is a completely alien concept to me. I don’t understand why I would need a gun, and even if I did I don’t know if I could trust myself with it! Not that I would kill anyone of course, just the idea of having an easily accessible gun in a volatile situation scares me. Anyway, I have come across many opinions, from the army veteran who says that he will need it for self-preservation (his argument was the only one that made sense, especially in the context of having actually lived in a warzone), via those who feel they may need it to protect themselves one day, right through to those who compare it to a basic right because otherwise we are stripping them of a freedom. (I also read a few ridiculous statements, saying that the US is more dangerous than Europe as there are “very bad people” here, and stuff about it being Mexico’s fault). I understand why someone might want to own a gun: maybe they like to hunt game, or maybe they live in a remote area where wild animals roam at night. Maybe they legitimately fear for their lives where they live and own one for protection. But is there really any need to own a semi-automatic weapon? There wouldn’t be much left to eat of your deer if you used that to hunt! Does one really require a grenade launcher hanging out in their house (unless you are Schwarzenegger in Commando I suppose)? How can a simple background check decide whether someone is going to murder a ton of people or not? How can you properly vet a person before handing over a lethal weapon to them? I know that there is no way a full ban on firearms will ever happen in the US, but what about a ban on assault weapons as well as stricter gun laws, like they have in Australia? I remember all too well the Dunblane massacre in Scotland in 1996 – this lead to huge changes in the already strict gun laws in the UK the following year. One of the main pro-gun arguments I have read over the past few days is the eternal “guns don’t kill, people do” referring to the idea that if people don’t have guns they will use something else. The thing is, materials used to make bombs, such as fertilizer, were restricted after the Oklahoma City bombing in 1995. Domestic airport security is a hell of a lot stricter since 9/11. But, even when members of the government try to push for stricter gun laws, they are continuously pushed back. What is it about the Second Amendment that is SO important to people? After Sandy Hook I thought that no one would be willing to accept the deaths of little kids, that from there onwards we would see laws change, maybe even an amendment to the second amendment. But no… It chills my heart to think that people will turn a blind eye to the deaths of children, just so they can keep their precious weapons. Again I ask, why do you REALLY need an assault rifle? And don’t get me started on the conspiracy theories and denial stories – all of these mass shootings have taken place and will continue to take place as long as there are no changes made. Most of us aren’t asking for a complete ban on firearms, but stricter laws. Imagine if you had to provide legitimate proof of why you require a firearm… If you were Dylann Roof or Stephen Paddock you would have had a much more difficult time finding the weapons to kill all of those people. Maybe you would have given up, maybe you would have used other means, but it would never have been so easy to murder all those people in such a short amount of time. 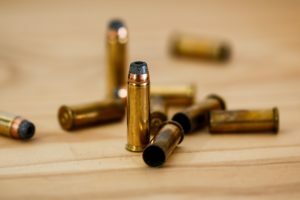 So, as most of the mass shootings happen with legally purchased firearms, what are we collectively going to do to stop them from happening over and over again? *Organization focused on collecting support for gun safety.